"REINVENT YOUR MASON JARS! Turn your mason jar into a drinking bottle or use it store dry or liquid goods. This lid provides and air tight, dependable seal to keep you foods fresh and insure that it will never leak. SUPERIOR STYLING. Whether you are using your flip cap lid to take food and drink with you on the go or to store food in your pantry, you will appreciate the retro good looks of the lid! INNOVATIVE FEATURES. No messes, no wet noses! The flip cap springs open and stays open when you are pouring or drinking, it will never flop back down while you are pouring or drinking. The flip cap is securely attached, it will never fall off. DEPENDABLE, LOW EFFORT SEALING. The integrated silicone gasket provides a secure seal with the jar that is guaranteed not to leak. The ingenious seal design reduces friction between the jar and the lid so that the lid can be remove easily. Made of FOOD GRADE, FDA compliant, BPA free plastic and silicone. Dishwasher safe. Fits all wide mouth mason jars including Ball and Kerr brands. NOT FOR CANNING." REINVENT YOUR MASON JARS! Turn your mason jar into a drinking bottle or use it store dry or liquid goods. This lid provides and air tight, dependable seal to keep your foods fresh and ensure that it will never leak. SUPERIOR STYLING. Whether you are using your flip cap lid to take food and drink with you on the go or to store food in your pantry, you will appreciate the retro good looks of the lid! INNOVATIVE FEATURES. No more messes! The flip cap springs open and stays open when you are pouring or drinking, it will never flop back down while you are pouring or drinking. The flip cap is securely attached, it will never fall off. DEPENDABLE, LOW EFFORT SEALING. 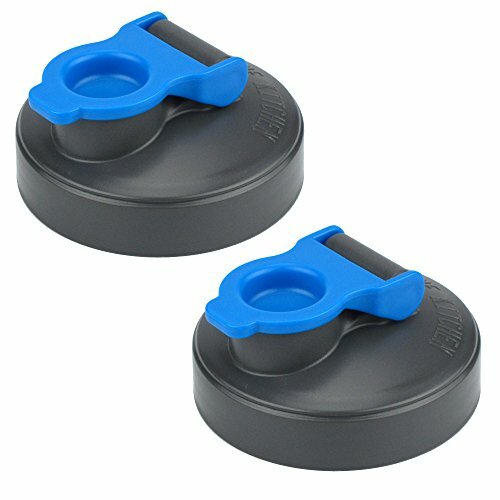 The integrated silicone gasket provides a secure seal with the jar that is guaranteed not to leak. The ingenious seal design reduces friction between the jar and the lid so that the lid can be removed easily. CHECK YOUR JAR SIZE IN THE LAST IMAGE This lid fits WIDE MOUTH jars only. Made of FOOD GRADE, FDA compliant, BPA free plastic and silicone. Dishwasher safe. Fits all wide mouth mason jars including Ball and Kerr brands. NOT FOR CANNING. If you have any questions about this product by County Line Kitchen, contact us by completing and submitting the form below. If you are looking for a specif part number, please include it with your message.